Councillor Davie Paterson is urging fellow Teries to help police track down the culprits responsible for graffiti spray-painted in Hawick's Old Manse Lane. 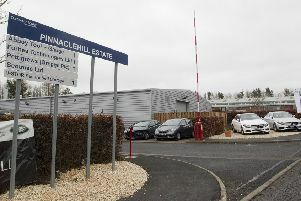 Calls are being made for an urgent public meeting to be held in Hawick in a bid to find a solution to a surge in anti-social behaviour, vandalism and thefts in the town over recent weeks. In the latest alarming incident, six youngsters, three of them thought to be no more than eight years old, went on the rampage in the town’s Orchard Crescent. One of the boys was seen to run up and kick the wing mirror off a red Toyota Aygo parked in the street. That follows on from a spate of recent reports of anti-social behaviour, particularly in Howegate, where an 86-year-old woman was terrorised in her home by youngsters kicking at her door. In a separate incident, again at Howegate, traffic was brought to a standstill last week by youths throwing food at cars. A woman who got out of her vehicle to confront the young yobs was faced by a barrage of verbal abuse. Now, in the latest vandal attack to hit the town centre, graffiti has been painted on a cemetery wall in Old Manse Lane. Additionally, police have been called out to a growing number of thefts from businesses, sports organisations, vehicles and retail outlets since the beginning of the year, including the theft of rugby balls and kit from a container at Volunteer Park. That recent succession of disturbing incidents has led to calls for a public meeting to be held as a matter of urgency. Hawick and Hermitage ward councillor Davie Paterson fully supports such a move. He said: “It’s like these mindless yobs don’t want to live in a nice town”, adding: “After an extremely concerned constituent had brought it to my attention about the graffiti spray-painted on the church wall at Old Manse Lane, I immediately went along to have a look for myself. “Sure enough, there it was. I have contacted the police and the council to see if they have any clues who could have been responsible for this wanton vandalism on a wall supporting St Mary’s cemetery. Members of Hawick Community Council have contacted town councillor George Turnbull, as chairman of Scottish Borders Council’s police, fire and rescue and safer communities board, to request that it urgently arrange a public meeting in Hawick Town Hall to address “widespread community concern over multiple recent examples of vandalism, theft and public disorder which are causing serious disruption to our otherwise peaceful town”. However, Mr Turnbull said the board’s remit is on a strategic level and does not extend to operational matters such as vandalism, theft and public disorder. He has suggested instead that the community council invite the police to one of its meetings after the Easter break and invite members of the public to attend to air their thoughts. Whatever form the meeting takes, it can’t come soon enough for Mr Paterson. “Something needs to happen because it can’t go on like this,” he said. “It’s a shame that there’s not enough police on the beat. “That’s something I have long called for but that is not likely to happen now under Police Scotland. “We need to target hotspots for trouble such as Howegate, but now Howegate is not the only area affected. “We spent money on a new community action team and a new surgery, and I was hoping that would help things.